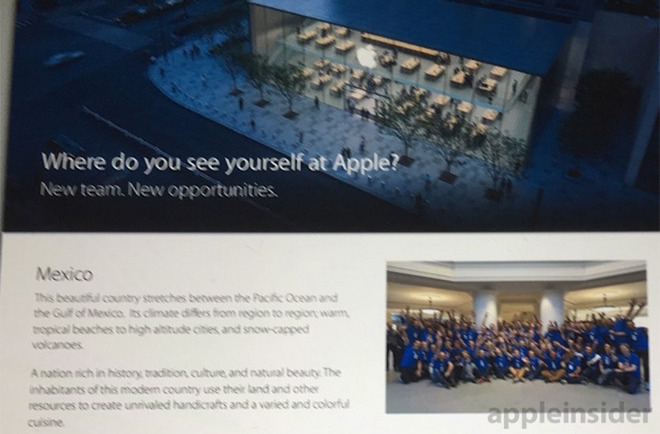 Confirming a recent AppleInsider report, Apple on Friday announced its first Mexican Apple Store will be an in-mall outlet in Mexico City for which the company is now accepting online job applications. In a statement issued to local website Sopitas, Apple confirmed construction of a new Apple Store is underway in Mexico City's Santa Fe Mall, asking those interested in taking a retail position apply through the company's website. CEO Tim Cook linked to the report in a tweet. "We are very excited to begin the process of hiring the team that will open our first Apple Store in Mexico, a country rich in art, culture and history. We are excited to provide our valued customers in Mexico City service, training and entertainment that Apple customers around the world love," Apple said. AppleInsider reported on Apple's push into Mexico on Monday. The forthcoming Apple Store will call Centro Santa Fe mall's upscale Via Santa Fe wing home, and is to be the first of many brick-and-mortar locations planned for the Latin American market. According to a source familiar with Apple's plans, a second Mexico City outlet will rise as a so-called "global flagship," equal in scale to recent Chinese stores and U.S. counterparts like the Union Square outlet in San Francisco. While the Sopitas report claims two more Apple Stores are in the works for Guadalajara and Monterrey, Apple will first concentrate on establishing a presence in Argentina, Chile and Peru, the person said. Only two physical Apple Stores exist in Latin America, both of which are located in Brazil. Apple does, however, have an online sales presence in the region with multiple country-specific stores. There is no information on when the Mexico City locations are expected to open, though both will be completed within a year of each other, the source said.